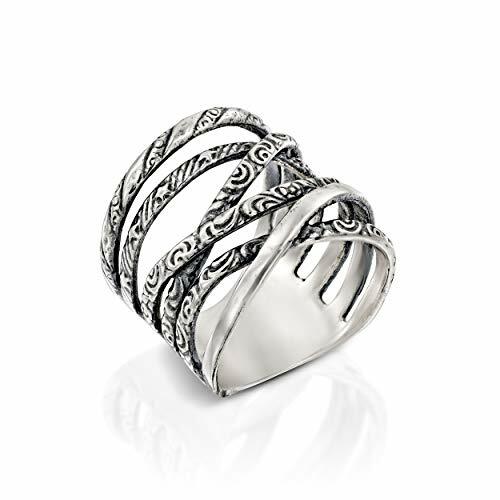 ♥ STERLING SILVER ♥ -This Statement Ring is made from the finest sterling silver as indicated with .925 metal stamp! Hand Crafted and manufactured in Israel by Israeli artisans. The Sterling silver is hypoallergenic, nickel and lead free so it is safe for people with nickel or lead allergies. 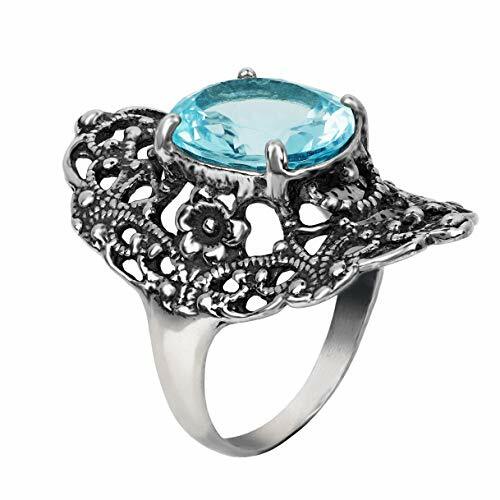 ♥ SKY BLUE TOPAZ GEMSTONE ♥ - The beauty of the stunning sky Blue Topaz stones truly shine with this ring - blue topaz has often symbolized long life, wisdom and knowledge. With a High quality prong set, a truly classic stone that radiates, confidence and power - perfect for December born babies! ♥ COMFORTABLE FIT ♥ - Comes in five different sizes! The tapered smooth shank is Comfortable to wear! Please refer to our sizing guide for help and tips on ring sizes! ♥ NATURE INSPIRED DESIGN ♥ - The Openwork Filigree Design is highly inspired by the shapes and styles we find in the nature around us and how it is represented in many Middle Eastern and Oriental cultures. The intricate design is full of detail and pleasure to look at! ♥ STERLING SILVER ♥ This high quality bracelet cuff has been made from the finest sterling silver as indicated with .925 metal stamp. Designed and manufactured in Israel by Israeli artisans. Sterling silver is hypoallergenic, nickel and lead free so it is safe for people with nickel or lead allergies. 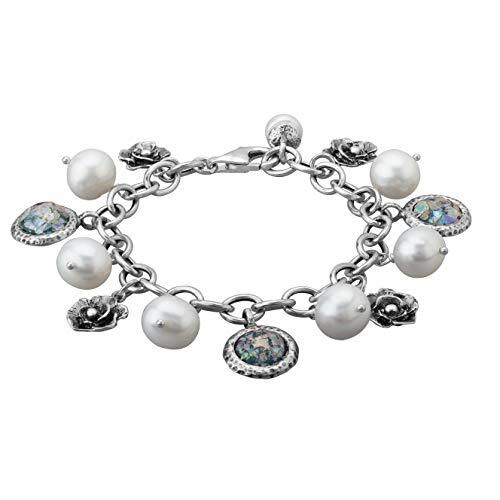 ♥ ELEGANT LOOK ♥ Add this great bracelet to your jewelry collection and know that you're wearing a high quality, stunning treasure that will give you years of pleasure! ♥ GENUINE GEMSTONES ♥ A beautiful triplet turquoise stone. Why is it called a triplet? This turquoise gemstone has received an extra protective layer of clear quartz to ensure durability and to protect the stone from scratches and fading. 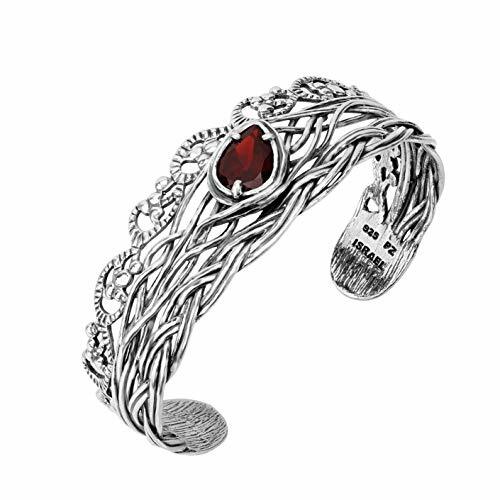 ♥ STERLING SILVER ♥ - This high quality bracelet cuff has been made from the finest sterling silver as indicated with .925 metal stamp. Designed and manufactured in Israel by Israeli artisans. Sterling silver is hypoallergenic, nickel and lead free so it is safe for people with nickel or lead allergies. 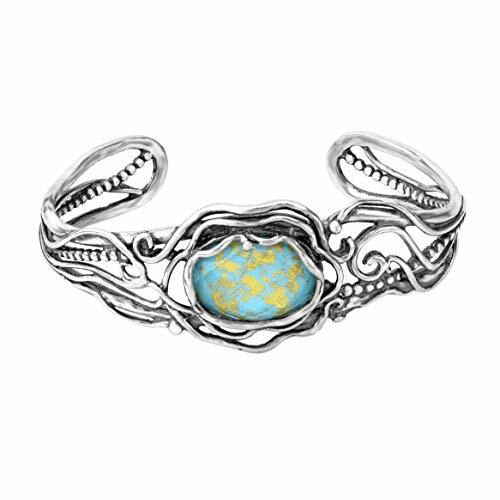 ♥ ELEGANT LOOK ♥ Add this great bracelet, and your choice of gemstone, to your jewelry collection and know that you're wearing a high quality, stunning treasure that will give you years of pleasure! ♥ GENUINE GEMSTONES ♥ Available in your chose of Genuine Blue Topaz, Amethyst or Garnet gemstones, beautifully 3-prong set. ♥ GREAT AS A GIFT ♥ - Your beautiful treasure arrives in a pretty eco-friendly pouch and would be a perfect gift for your sister, mother, daughter, best friend or even yourself! Your jewelry box will love you! With Paz Creations, you have purchased a high quality piece of jewelry which will be treasured for years to come. 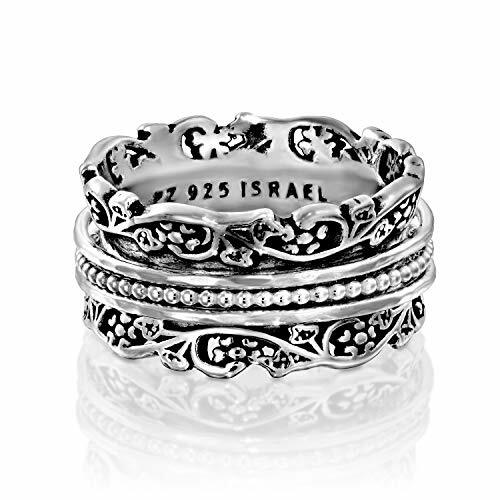 ♥ SOLID STERLING SILVER ♥ -This stacking ring set is made from the finest sterling silver as indicated with .925 metal stamp! 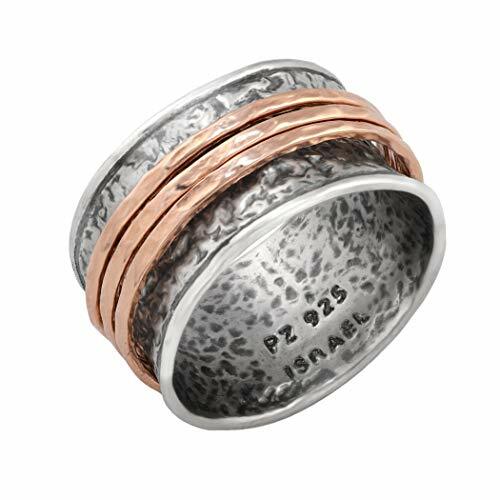 Designed in Israel, The Sterling silver is hypoallergenic, nickel and lead free so it is safe for people with nickel or lead allergies. ♥ CUBIC ZIRCONIA GEMSTONE ♥ - Marvel at the glorious shine of 5 Sparkling Cubic zirconia Gemstones! With a High quality Bezel prong set this piece makes a BIG statement for an excellent price! Perfect for October babies! ♥ 5 STACKED BANDS ♥ - Mix and match however you like! 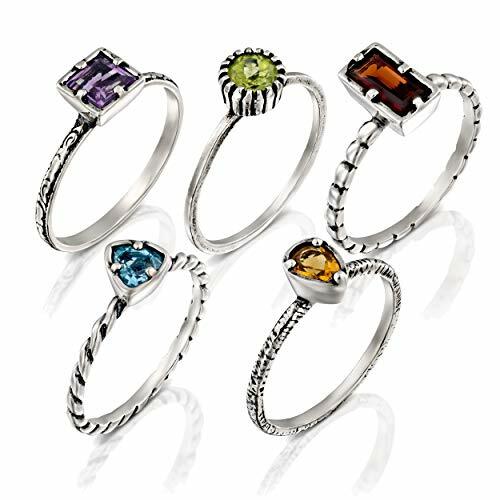 Wear on separate fingers or on one, wear one at a time or all at once! It's also a perfect gift for your best friends. 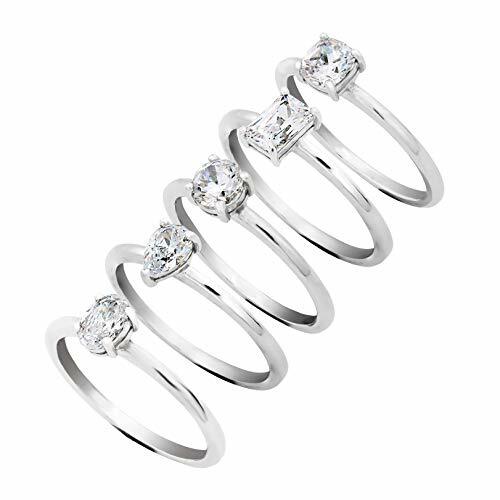 ♥ CLEAN, ELGENT LOOK ♥ - This Sterling Silver Zirconia Band Set has a high polished clean look! Perfect for an elegant bridal, engagement ring or just everyday use. Make a clear statement for an awesome price. 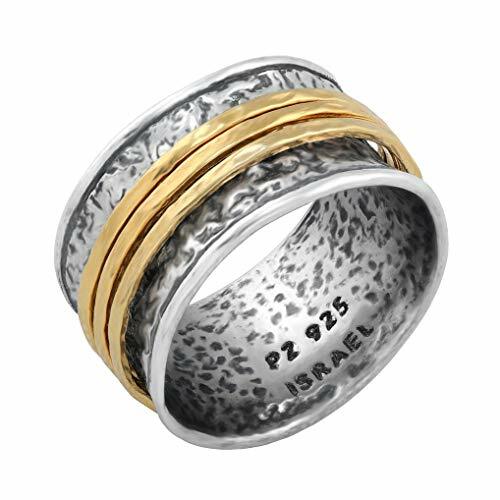 ♥ GOLD OVER STERLING SILVER ♥ -This textured hammered ring is made from the finest sterling silver as indicated with .925 metal stamp! With a gold over silver plating. Hand Crafted and manufactured in Israel by Israeli artisans. The Sterling silver is hypoallergenic, nickel and lead free so it is safe for people with nickel or lead allergies. ♥ SPIN IN STYLE ♥ - Has three gold plated spinners that spin freely around the shank. The spinning motion in calming and meditative, helps reduce anxiety and is perfect for restless people who need something to fidget with. 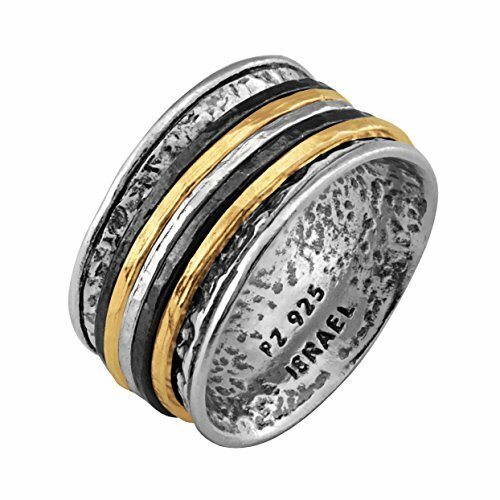 ♥ TRUE CRAFTSMANSHIP ♥ - The combination of the oxidized and hammered finish give this ring its unique Israeli artisan look and feel. Choose from to variations - the popular Rose Gold or Classic yellow Gold. 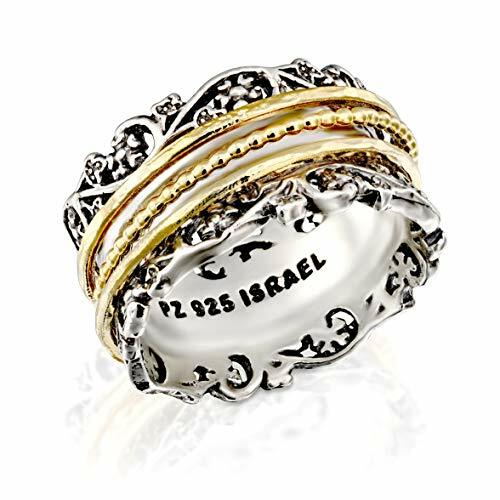 This ring is a true example of fine craftsmanship from the holy land. ♥ COMFORTABLE FIT ♥ - Comes in 5 different sizes! 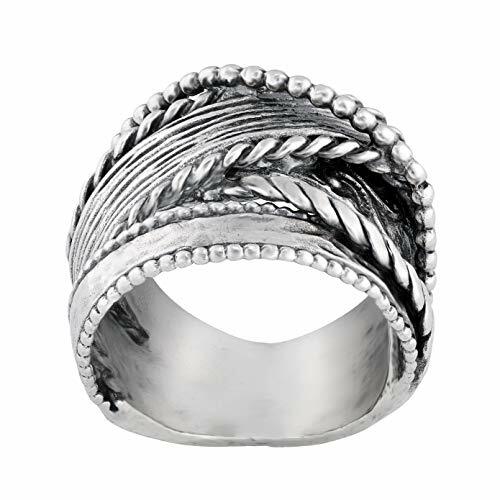 The hypoallergenic silver ring is comfortable to wear. The tempered shank of the ring give it its unique statement look while keeping a comfortable fit - please refer to the sizing chart to find your ring size. 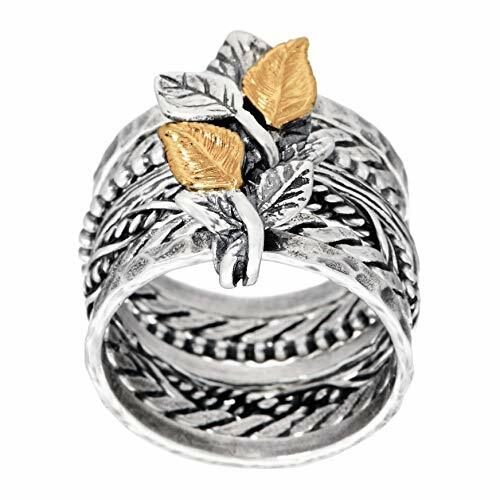 ♥ STERLING SILVER ♥ -This multi textured hammered ring is made from the finest sterling silver as indicated with .925 metal stamp! Hand Crafted and manufactured in Israel by Israeli artisans. The Sterling silver is hypoallergenic, nickel and lead free so it is safe for people with nickel or lead allergies. ♥ COMFORTABLE FIT ♥ - Comes in 6 different sizes! 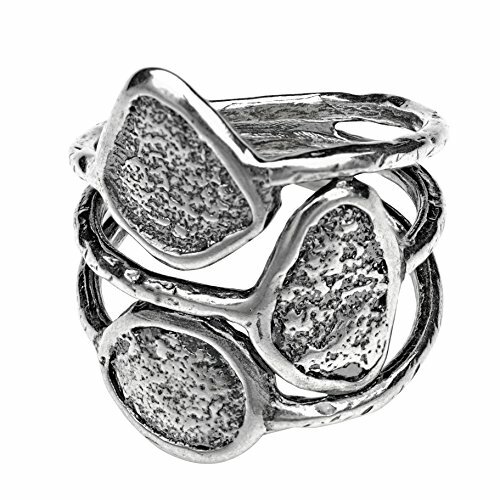 The hypoallergenic silver ring is comfortable to wear. 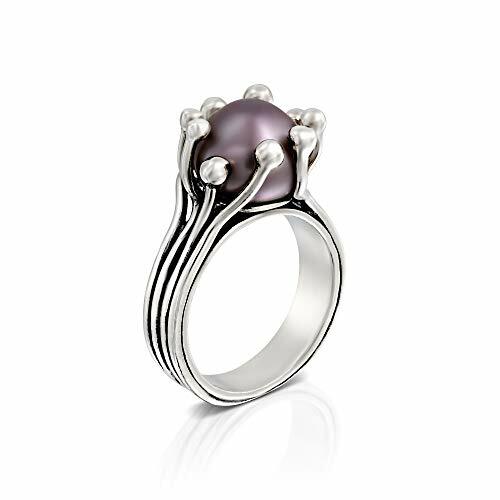 The tempered shank of the ring give it its unique statement look while keeping a comfortable fit - please refer to the sizing chart to find your ring size. 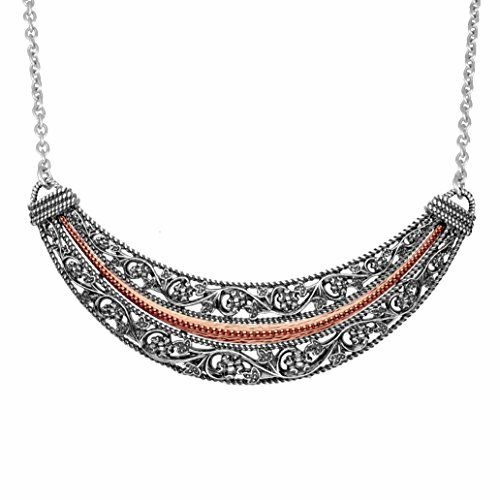 ♥ STERLING SILVER AND ROSE GOLD ♥ - Plated with Rose Gold, This necklace has been made from the finest sterling silver as indicated with .925 metal stamp. Designed and manufactured in Israel by Israeli artisans. Sterling silver is hypoallergenic, nickel and lead free so it is safe for people with nickel or lead allergies. ♥ COMFORTABLE FIT ♥ - This necklace is 16.5" long with a 2" extender. The high quality sterling silver Rolo cable chain necklace with lobster clasp closure is easy to use and comfortable to wear. ♥ ELEGANT LOOK ♥ Add this great necklace to your jewelry collection and know that you're wearing a high quality, stunning treasure that will give you years of pleasure! 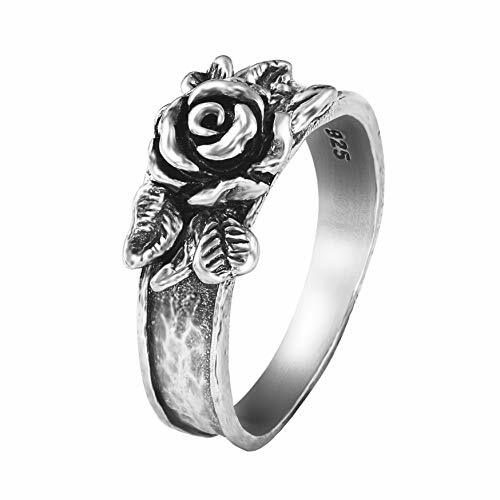 ♥ STERLING SILVER ♥ -This rose ring is made from the finest sterling silver as indicated with .925 metal stamp! Hand Crafted and manufactured in Israel by Israeli artisans. The Sterling silver is hypoallergenic, nickel and lead free so it is safe for people with nickel or lead allergies. ♥ NATURE INSPIRED DESIGN ♥ - With this clean and simple rose design, we have tried to capture the beauty in the organic motifs of the nature around us. a high quality oxidization and hammered finish make the details truly pop out. This ring is a beautiful example of Middle Eastern craftsmanship. ♥ COMFORTABLE FIT ♥ - Comes in three different sizes! 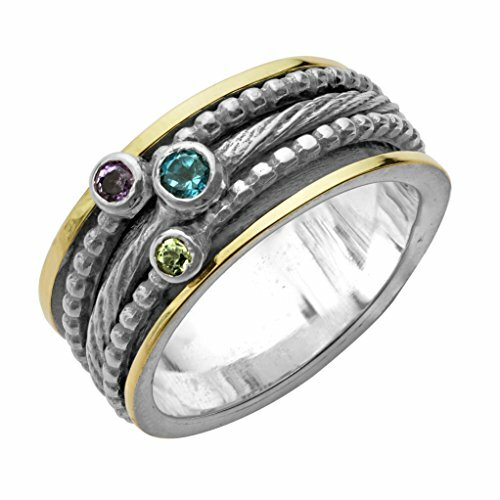 The lightweight hypoallergenic silver ring has a thin tempered shank which looks good and is comfortable to wear. 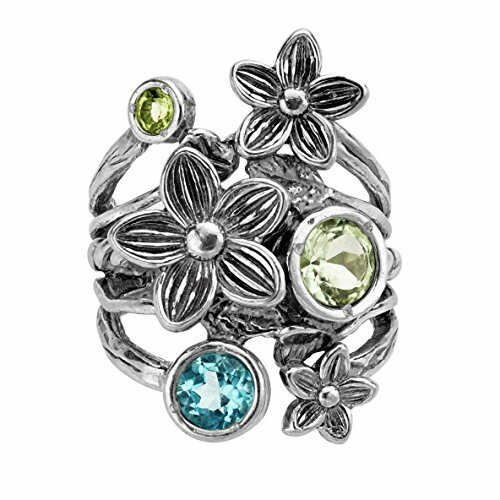 ♥ HOW DO YOU KEEP YOUR STERLING SILVER BEAUTIFUL? ♥ - We recommend routine maintenance. To minimize the tarnishing of your Sterling Silver Jewelry, keep it away from harsh chemicals (which include hairspray, perfume detergents or deodorants). To restore its luster, buff your sterling silver jewelry with a soft cloth, before storing them in a moisture free box. Dry and store your Paz Creations purchase in your eco-friendly soft cloth pouch to prevent dulling, tarnishing or scratches. ♥ STERLING SILVER ♥ This Spinner Ring is made from the finest sterling silver as indicated with .925 metal stamp! Hand Crafted and manufactured in Israel by Israeli artisans. The Sterling silver is hypoallergenic, nickel and lead free so it is safe for people with nickel or lead allergies. 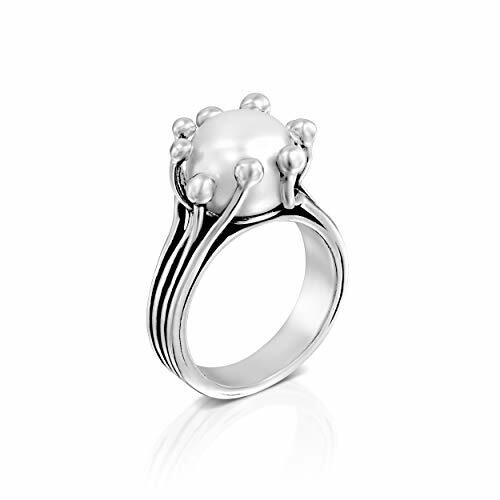 ♥ SPIN IN STYLE ♥ Our BEST SELLING ring! Has three silver spinners that spin freely around the shank. The spinning motion in calming and meditative, helps reduce anxiety and is perfect for restless people who need something to fidget with. ♥ COMFORTABLE FIT ♥ - Comes in six different sizes! The smooth shank is Comfortable to wear! 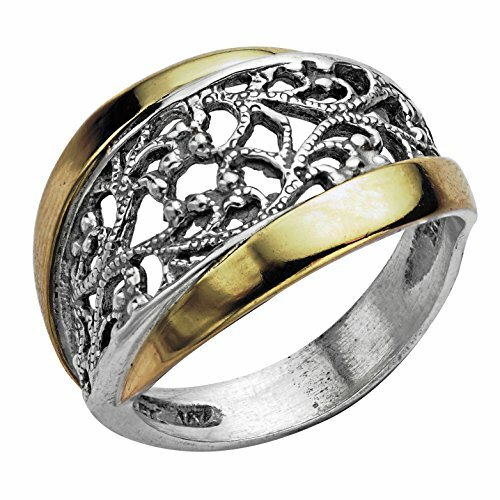 ♥ STERLING SILVER & 14K GOLD ♥ -This Multi Band Ring is made from the finest sterling silver as indicated with .925 metal stamp! The 14k CAST gold leaves are expertly soldered individually! Hand Crafted and manufactured in Israel by Israeli artisans. The Sterling silver is hypoallergenic, nickel and lead free so it is safe for people with nickel or lead allergies. 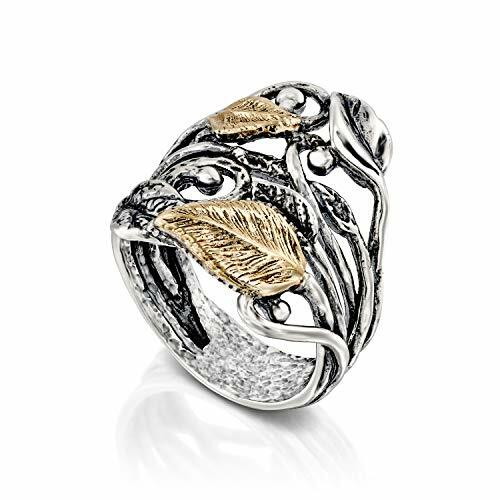 ♥ 7 STACKED TEXTURED BANDS ♥ - The seven textured ring bands include hammered, twisted, rope, beaded and are held together with a beautiful vertical leaf band with soldered 14k gold leaves. 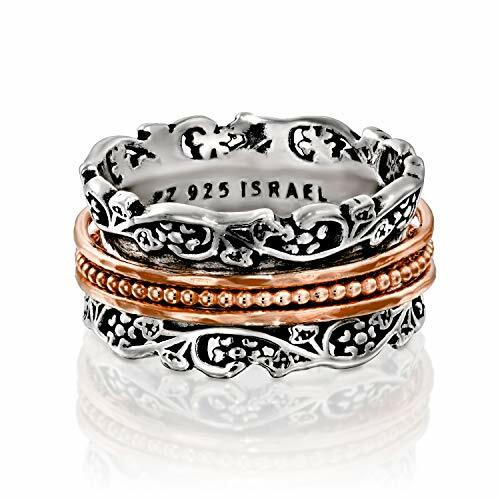 Paz Creations ♥925 Sterling Silver Multi-Row Oxidized Ring (7), Made in Israel . ♥ STERLING SILVER & 14K ROSE GOLD PLATING ♥ -This Spinner Ring is made from the finest sterling silver as indicated with .925 metal stamp! With three separate 14k Rose gold plated spinners! Hand Crafted and manufactured in Israel by Israeli artisans. The Sterling silver is hypoallergenic, nickel and lead free so it is safe for people with nickel or lead allergies. ♥ SPIN IN STYLE ♥ - Our BEST SELLER ring! Has three silver spinners that spin freely around the shank. The spinning motion in calming and meditative, helps reduce anxiety and is perfect for restless people who need something to fidget with. ♥ COMFORTABLE FIT ♥ - Comes in six different sizes! The tapered smooth shank is Comfortable to wear! Please refer to our sizing guide for help and tips on ring sizes! 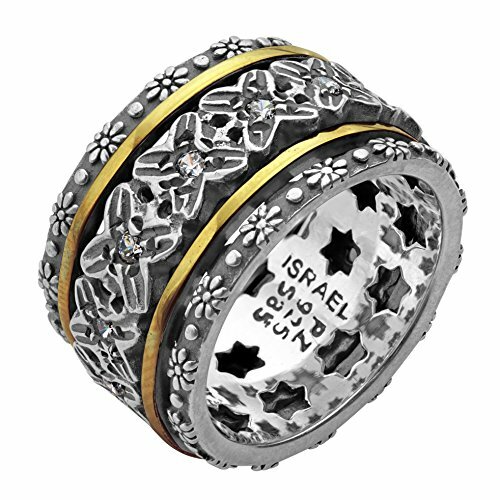 ♥ STERLING SILVER & 14K GOLD PLATING ♥ -This Spinner Ring is made from the finest sterling silver as indicated with .925 metal stamp! With three separate 14k gold plated spinners! Hand Crafted and manufactured in Israel by Israeli artisans. The Sterling silver is hypoallergenic, nickel and lead free so it is safe for people with nickel or lead allergies. 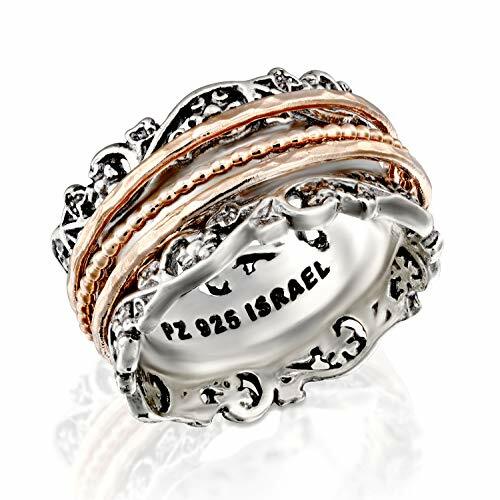 ♥ STERLING SILVER ♥ -This Highway Ring is made from the finest sterling silver as indicated with .925 metal stamp! Hand Crafted and manufactured in Israel by Israeli artisans. The Sterling silver is hypoallergenic, nickel and lead free so it is safe for people with nickel or lead allergies. ♥ NATURE INSPIRED DESIGN ♥ - The Openwork highway Design is highly inspired by the shapes and styles we find in the nature around us and how it is represented in many Middle Eastern and Oriental cultures. The intricate design is full of detail and pleasure to look at! ♥ STERLING SILVER AND ROSE GOLD OVER SILVER ♥ -This Spinner Ring is made from the finest sterling silver as indicated with a Silver metal stamp. Has three separate Rose gold plated silver spinners. Designed and handcrafted in Israel by Israeli artisans. The Sterling silver is hypoallergenic, nickel and lead-free so it is safe for people with nickel or leads allergies. ♥ SPIN IN STYLE ♥ - Has three textured silver spinners that spin freely around the shank. The spinning motion in calming, meditative and helps reduce anxiety. Perfect for restless people who need something to fidget with. ♥ COMFORTABLE FIT ♥ - Comes in six different sizes. The tapered smooth shank is Comfortable to wear. Please refer to our sizing guide for help and tips on ring sizes. ♥ PERFECT AS A GIFT ♥ - Your beautiful treasure arrives in a pretty Eco-friendly pouch and would be a perfect gift for your sister, mother, daughter, best friend or even yourself! Your jewelry box will love you! With Paz Creations, you have purchased a high-quality piece of jewelry which will be treasured for years to come.